We were aiming for the Mandalay Inn, picked from the Lonely Planet guidebook, but the only spare rooms they had were on the third floor, which was not so good for Richard. So we ended up in the Angkor Park hotel just across the road — clean (almost new) and comfortable and only $12/night. Siem Reap, once a village, is now a bustling town with a huge tourist industry, with over two hundred places offering accommodation, from backpackers to five star luxury hotels, and a plethora of restaurants and other tourist services. It even has its own international airport — Angkor Wat must be the most visited tourist attraction in mainland Southeast Asia. Lunch was sweet and sour pork, mango lassi, banana pancakes, and coffee. I checked the hotel wifi worked and sent some email and then we headed off. 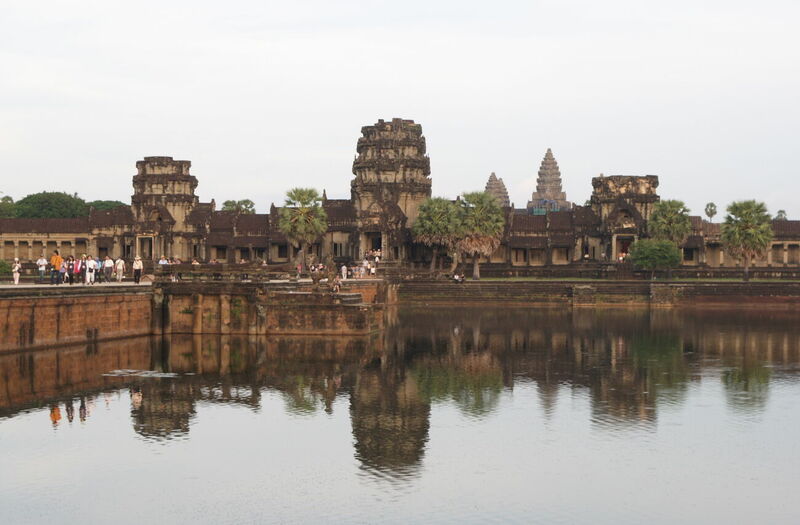 "Angkor Wat" is sometimes used to refer to the whole collection of abandoned cities and temple complexes, spread over more hundreds of square kilometres. 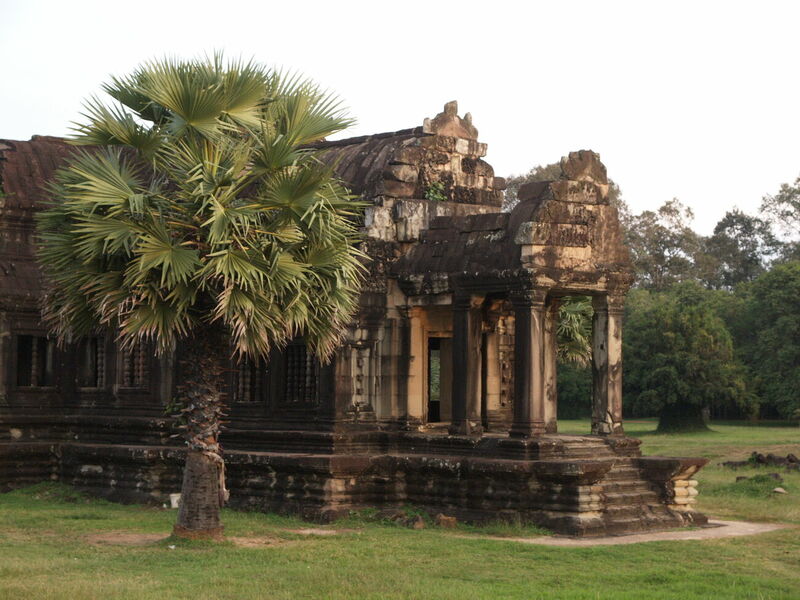 As a guide to the temples I used Dawn Rooney's Angkor: Cambodia's Wondrous Khmer Temples, roughly following six or seven of her suggested "itineraries". This is excellent — the link above is to my full review — but there are plenty of books on Angkor! 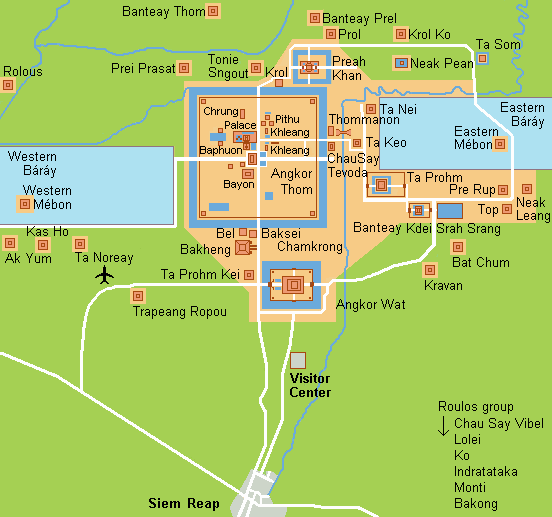 Angkor Wat is actually a specific site within that complex, however. Since it is the closest of the sites to Siem Reap, and one of the ones recommended for an evening visit, that was our first target. 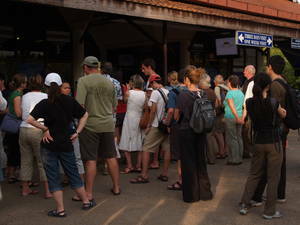 Getting our Angkor Passes from the main Visitor Centre involved some waiting and long queues. I opted to pay $60 for a one week pass, figuring I would be there for four full days and two half-days, while Richard got the $40 three day pass, planning to take some rest days. The towers at Angkor Wat aren't that tall, but the complex is laid out to make the approach dramatic. And there are some beautiful carvings, though the light was already a bit dim for photography. I was already planning to return. The crickets were making a lot of noise, to the extent that I was completely convinced it was an alarm signal warning everyone it was getting late and that the site would be closing!